This is the most simple FM transmitter circuit diagram you can ever find. This circuit is really cool and cheap to build. This FM transmitter circuit runs at low voltage, on a CR2025 3V Lithium battery, current consumption is also low. And the total size of this F.M transmitter(including battery, excluding antenna) is less than that of a matchbox. The circuit has a central RF oscillator NPN transistor BF494 (substitute: BF194). A coil takes care of the output frequency. The coil has to made by yourself. 36 SWG wire 2.5turns only in 5mm diameter ferrite rod. Keep the circuit as small as possible. Try to use no wire in the main functional area(transistor and coil). The input from the audio output of computer/PMP/mobile is given to the biased base of the transistor. The transistor gives a RF humming accordingly to the audio input, and the FM wave is spread by the external antenna(Ariel). By using a standard T.V antenna, the range of this transmitter can go upto 1KM radius, using small(15-20cm) Ariel, it can work upto around 50M range. For even more low cost, use a new bicycle spoke for ariel, get it from cycle store at Rs 2/- . This circuit is most suitable for miniature FM transmitter for use in computer, mobile etc to send music to home theater system without wires, and in homemade wireless walky-talkies. For input from low power output devices, such as mobile, computer’s sound card, the value of the unlabeled capacitor is 0.1 or 104. For higher wattage outputs, the value is 0.01 or 103. You can add a microphone pre-amplifier in this circuit to transmit voice directly. 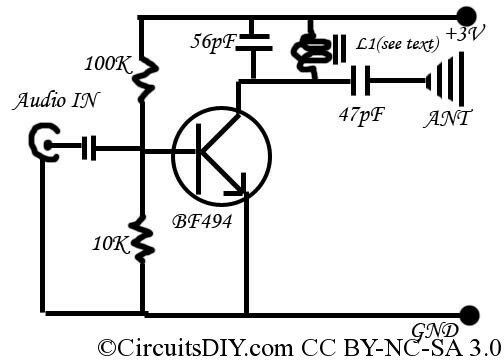 Keep in mind that this type of simple FM transmitter circuit are allowed for personal use. Commercial use of Radio frequencies (including FM) without permission is illegal in almost everywhere of the world. Hi there, if you don’t mind, I have a couple of questions. How much inductance does the coil have in uh? Is a BF195 a substitute for a BF494, and are there anymore substitutes? What frequency is the coil? thanks for the article and i would be thankful to know on which frequency can i hear the sound???? On what FM frequency does this transmit? It depends on the tank circuit, in this case L1, 56pF capacitor, and the capacitance between the base and collector of the transistor. Yikes – above my head. Any helpful resources? Is there a tool that can calculate the frequency from the items you mentioned? Thank you in advance.